The premier world motorsport trade exhibition sees the return of Geartronics for 2010. Following our absence in 2009, we will be returning to the Birmingham NEC in January 2010 to showcase our intelligent semi-auto shift system. Come and visit us on stand E455 and see the shift system in action. We will be demonstrating our next generation GCU, complete with a 6x faster processor, CAN interfaces, Deutsch Autosport connectors, and many other enhancements required by the professional market. 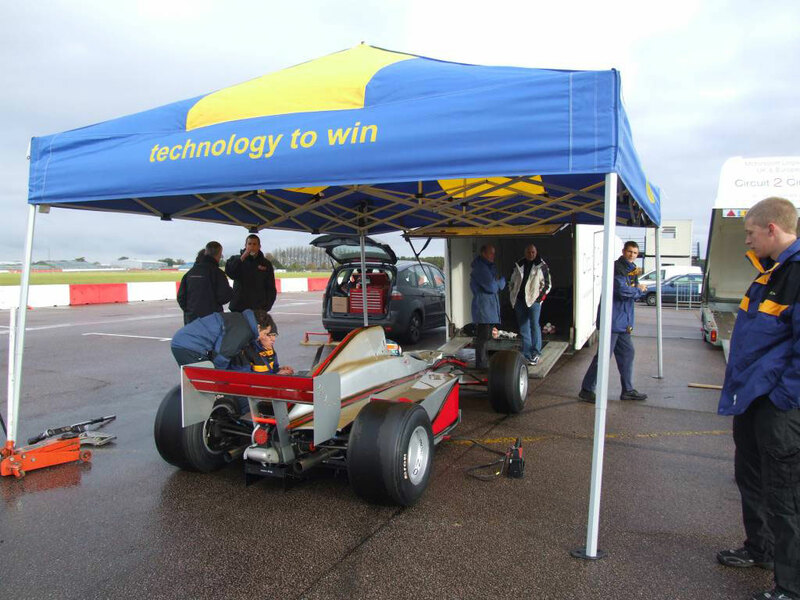 The new Hayabusa powered Reynard Inverter has been successfully tested at the Silverstone circuit in Northamptonshire. The original prototype Inverter (powered by a Honda Fireblade engine) has been running with the system throughout the summer in the hands of Generation Motorsport. The driver shaking down the new car was former Honda F1 test driver James Rossiter. After suggesting a small increase in the amount of throttle blip for the downshifts, Rossiter commented that the system was fast and smooth - with not a single missed shift all day. Not a bad endorsement from a driver accustomed to the ‘seamless shift’ technology of F1. The Geartronics paddleshift system is being offered as factory option on all Inverters sold. Paddleshift now available for the Suzuki Hayabusa gearbox. In partnership with CTR Developments, we have designed a barrel sensor modification to allow our intelligent closed-loop semi-automatic shift system to be used with this popular engine/gearbox combination. Why use an open-loop timer based system when you can now have the sophistication of closed-loop technology using direct barrel position feedback? 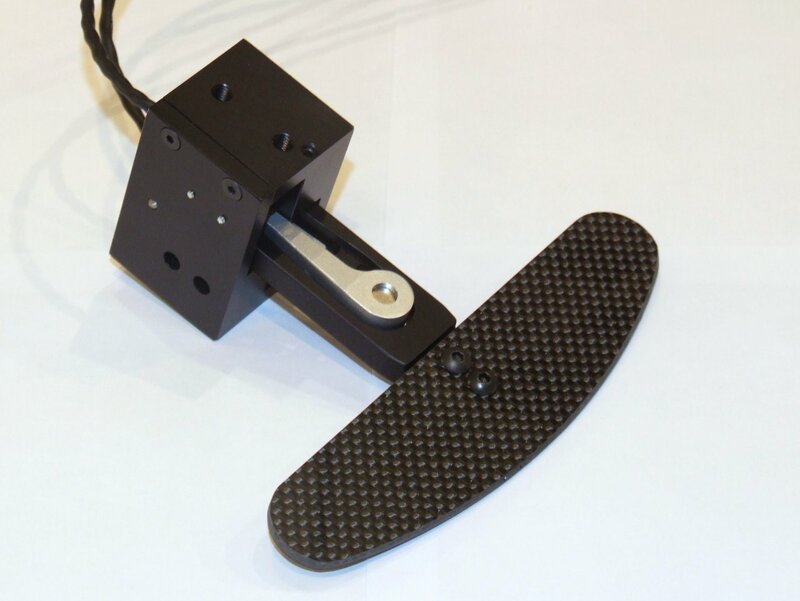 After intense customer demand, we have designed and manufactured a single paddle assembly for rally use. Along the lines of most WRC paddles, this unit allows the driver to make up and down shifts with a single hand. The unit is intended to be mounted statically, so that it does not rotate with the steering wheel. No more hitting the wrong paddle when you’re coming into a corner sideways! 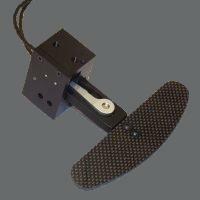 Please note that this unit is not available separately, and is only sold as part of our full paddleshift system. 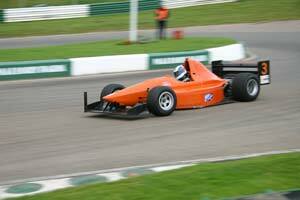 Lola choose Geartronics paddleshift for a customer ’F3000’ hillclimb car. Based on our now considerable experience and 100% reliability record in last year’s Euroseries3000 championship, Lola Cars took the decision to fit our semi-auto gearshift system to a customer hillclimb car. 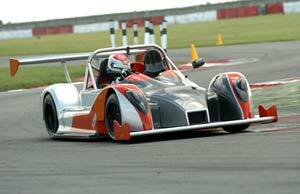 The car itself is based on a B99/50 F3000 chassis, but with a ‘hybrid’ aero package and an upgraded 3.3litre Zytek KV engine producing over 500bhp. The car was recently shaken down at a very wet Silverstone circuit, and after minimal setup time, the shift system was working perfectly on the ’99 spec 5-speed gearbox. 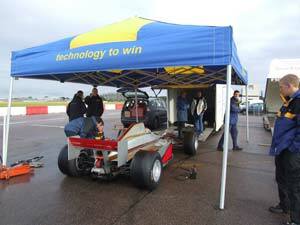 Lola also use our systems on their "World Junior" cars. Mallory Park outright lap record broken! The long-standing lap record at the Leicestershire track has been broken by Nick Algar in his Gould GR55 sprint car. 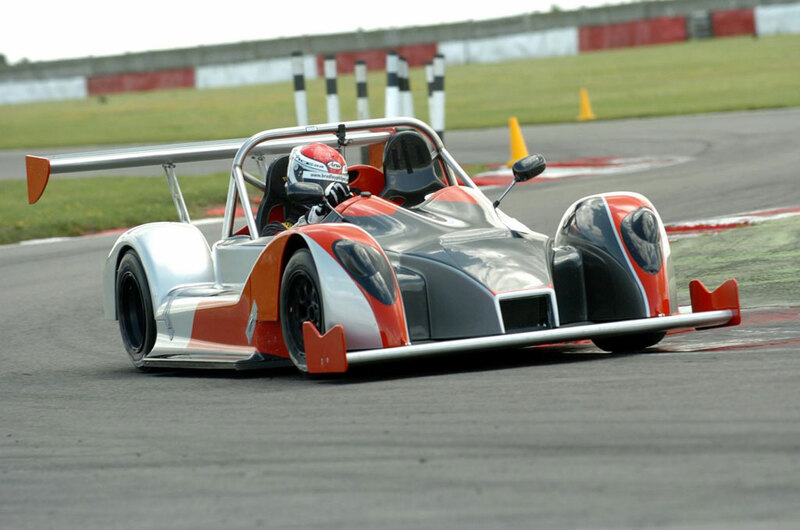 Nick lapped the 1.35 mile circuit in just 37.920secs at an average speed of 128.161mph! Nick fitted our shift system at the start of the season and stated that it transformed the car. As well as the Mallory record, Nick also won the 2009 British Sprint Championship, setting several other track records along the way. 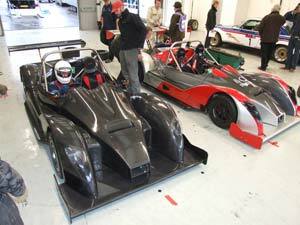 We've recently installed the system on the Reynard Inverter prototype fitted with the Fireblade engine/gearbox. In common with most bike gearboxes, there is no gear position sensor fitted as original equipment. So, just like we've done with the Hayabusa gearbox, we looked at fitting a sensor to the outside of the transmission case to measure the position of the selector barrel. After initial inspection of the gearbox, it was feared that it wouldn't be possible to run the system because there appeared to be no way to fit the all-important sensor. However, after much head scratching, we came up with an ingenious solution that involved re-manufacturing parts of the selector mechanism to allow the sensor drive to pass through it. The result – a reliable closed-loop pneumatically operated paddleshift system. Up to this point, any owners wishing to fit paddleshift to their Fireblade only had the option of fitting an open-loop system. Now you have a choice! The DJ Firestorm is revealed to the public at the Harewood Hillclimb. 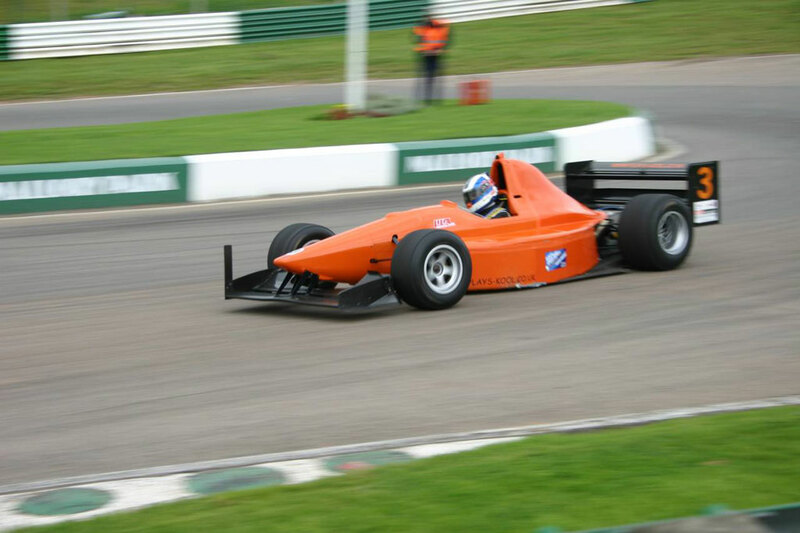 DJ Racecars, owned and driven by Wallace Menzies, is a welcome addition to the British Hillclimb Championship. With a normally aspirated Cosworth XD engine revving to 15000rpm, the car is sure to bring additional noise and excitement to the British hillclimb scene. Needless to say, Wallace & DJ chose to operate the Lola LT 6-speed gearbox with a Geartronics paddleshift system. Seven leading British Hillclimb Championship contenders choose the Geartronics paddleshift system. In the extreme environment of speed hill-climbing, every millisecond counts. That's why it's essential to have a gear shift system that you can trust. With a proven track record, the Geartronics paddleshift is the system of choice for any competitor wishing to gain the advantage. Italian race driving experience company, Puresport have fitted our paddleshift system to its two WSN cars. The sophisticated features of our system are ideally suited to these high-powered 3 litre V6 cars with their Ricardo gearboxes. Rosario Campagna, the company owner, approached Geartronics with the brief that the system had to be easy to use, reliable, and provide the necessary safety features that might be required to prevent inexperienced drivers from damaging the engine & gearbox. We tested the first car at the Misano circuit near Rimini (Italy) and its performance drew immediate praise from the test driver, Luca Persiani. Straight out of the box, the system performed perfectly, with fast and ultra smooth clutchless shifts, both up and down the box. The peculiar gear order of the Ricardo 500Nm box (R1N2) meant that we had to write some new software for our GCU – a service we're more than willing to offer, even for one-off applications. If you're looking for the ultimate driving experience, including the chance to drive Damon Hill's 1997 Arrows F1 car, then you won't go far wrong with Puresport! James Hoseason chooses the Geartronics paddleshift system for his Darrian GTR rallycar. 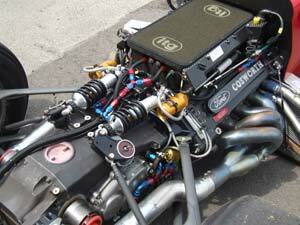 This car uses a MoTeC M880 ECU running a Millington series-2 engine driving through a Hewland NMT transmission. Once again the result is smooth and reliable shifts, with the option of full auto mode in the case of upshifts! See the pictures & video in the gallery of this amazing hi-tech car. All content is protected by copyright, Geartronics Ltd. 2001-2018.